In despair that they would be able to build a church they direly need in their village, a number of Copts from the village of Koum al-Loufi in Samalout, Minya, some 250km south of Cairo, held a stand publicising their demand on Sunday 4 June in front of the St Mark’s Cathedral in Abbassiya. The conservative Muslim villagers have been refusing to allow the Copts to worship in the village, let alone build a church. Local politicians and security officials have failed to persuade the Muslims to allow the Copts to exercise their constitutional right of freedom of worship and build a church in Koum al-Loufi. Obviously, fearing social unrest and unbridled violence should they force the village Muslims to accept a church in their midst, the local authorities opted for social peace and let matters lie at that. The Copts never got their church or the right to hold prayers anywhere in the village. “However, the extremists insisted this was not to be,” the statement said. 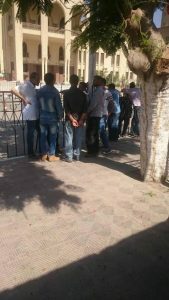 [Hoping to resolve the matter peacefully] the security authority repeatedly attempted to persuade them to agree to the Copts holding prayers in the village, but to no avail. As the negotiations lingered on, Egypt and its Copts were victims of a number of terrorist attacks, so we kept our peace in respect for the painful incidents that took place. But we paid the price dearly, since we were not allowed to worship in our village; and were even denied that right to worship in churches in nearby villages by extremist Muslims in these villages.